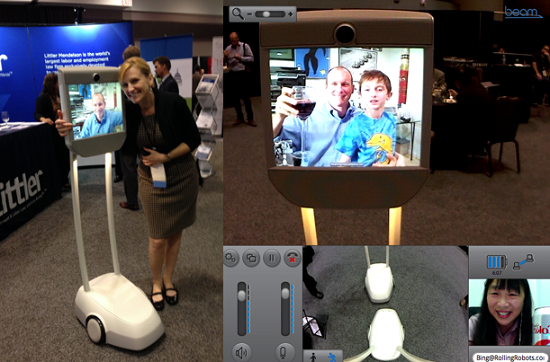 The Age of Attending Trade Shows Using Telepresence Robots Has Arrived! 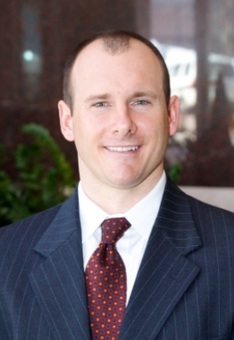 HSL: I attend about a dozen trade shows, conferences, and similar events a year.� I have been giving speeches for years via videoconferencing and telepresence including once using a telepresence podium to address two different audiences in two different cities on the same day. �I rent a Segway every year at the InfoComm trade show to maximize my productivity by trading time spent walking for time spent meeting with clients and partners AND the ability to accelerate myself around the exhibit floor to see twice as much as I would have seen on foot.� I describe the experience as getting two trade shows for the price of a Segway rental. So... If there was ever a target customer for attending conferences and trade shows more efficiently it would be me.�The ability to attend more events without the cost and pain of physical travel or the inefficiencies of losing so much time-in-transit would be super-impactful to me personally, my business, and my bottom line. What was the experience like?� How close was it to the usual and customary experience? What is the future of conferences and trade shows if attendees can simply "Beam" in from around the world without physical travel, hotels, and jet lag? HSL: The first thing both David and I were amazed at was how easy that Suitable Technologies had made the sign up process.� Hit a website, reserve your time, make a payment ($50 Early Bird, $100 Day-of-the-event for all-you-can-drive, first-come-first-served), watch a 2 minute instructional video, sign some electronic documents saying you won't drive the Beam down any stairs or cause other damage. and then you are thrown into a training class by logging on to a Beam robot at Suitable's corporate HQ where a staffer will help you practice your driving skills and give you some tips for maximizing the experience:� The Beam bot has a party mode where it cranks up the volume of the remote operator to make him easier to hear over the din of the trade show floor and how to share your screen on the bot's display. After your training you are then approved to login to the Beam on the day of the event. DSM: In the dark ages of visual collaboration, videoconferencing was completely location-based, not person-based. In other words, VC existed in board rooms because it was expensive and complicated. Rooms called rooms, people didn't call people. The undeniable fact is, sometimes you still want to call a location, not a person. If I can't make it to the big board meeting, I don't want to just call an attendee's tablet or phone. I want real "presence" in that room. I want to call THE ROOM, not the person. That may mean that I am attending via a Beam or other remote presence device, or that I am presented full sized, across the table, telepresence style. The key is that I am presenting myself as an actual meeting participant, not someone just "calling in". In the end, that is the truly compelling element of the Beam experience. It really is "remote presence" in the most literal sense of the words. I have called into tradeshows via video before, but this was different. I didn't feel like I was calling in. I felt like I was attending this conference. This effected how I interacted with other attendees, how they interacted with me, and how much I was able to really accomplish and learn at the event. Interestingly, Beam founder, Scott Hassan vehemently denies that his product is a robot. 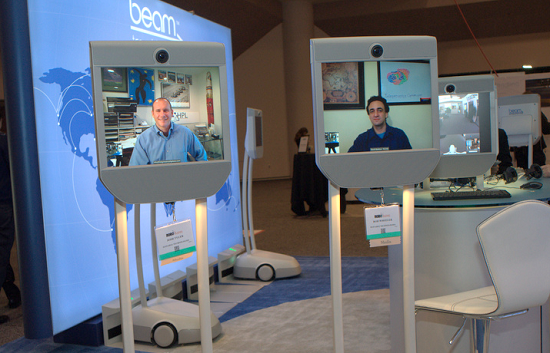 While the rest of the mobile remote presence vendors are happily selling robots, and despite the fact that the Beam looks like something out of a Pixar robot movie, the Beam is absolutely not a robot. I didn't get it either at first, but now it makes perfect sense. Scott explained that the goal isn't for you to drive a Beam around the show all day. The goal is to have hundreds (or thousands) of Beams all over the show, allowing you to simply "Beam" from device to device, from booth to booth. Why drive when you can just zap yourself there? This is Scott's dream. He understands that only kids and geeks (like yours truly) want to drive robots all day. Business people simply want to (yes I will say it again) "Beam" to a location, meet with people, and get work done. Scott isn't trying to create R2D2 from Star Wars, he is trying to create the teleportation device from Star Trek (the very obvious source of the product's name). "Beam me up Scotty" indeed! HSL:� I had a couple of people I know come up to me as I was cruising through the conference.� Erin Rapacki, General Manager of Industrial Perception, who I interviewed years ago when she was with telepresence robotics pioneer AnyBots who introduced me to her friend Sam Bouchard the President of RobotIQ.� I also ran into Marcus Rosenthal, CEO of Revolve Robotics, that is developing a robotic head and neck platform for the iPad called the Kubi to improve videoconferencing. I was amazed at how easy it was to meet people while driving the Beam.� I know there is some novelty right now but everyone (with the exception of the guy in the anecdote a couple of paragraphs down) was warm and friendly and conversations were quite natural.� In the picture on the right I am talking to Bing Jiang, the founder of Rolling Robots who was also attending via a rented Beam.� Bing took a photo of me and my 9 year old son during the reception (hence the glass of wine) from her Beam and emailed it to me. 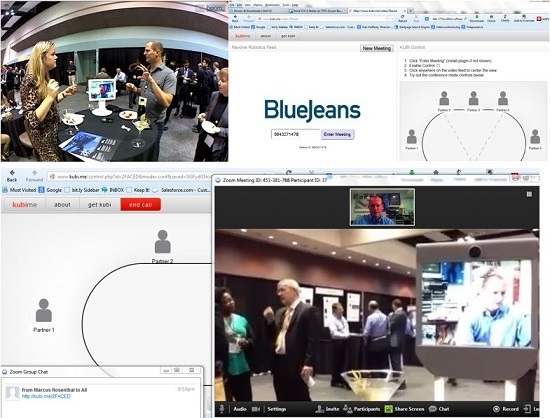 You're Not Really There - HSL: Obviously not the fault of the Beam, but this is one of the trade-offs of attending using remote presence.� No buffet, no shaking hands, no hugs, no shwag, no parties, etc. The Speed - HSL: I understand, since this was the first time a conference has ever made 50 remote presence devices available for rental, that the focus was on ensuring safety but limiting the Beams to a top speed of � a mile an hour was sloooww.� Maybe I am just used to bombing around InfoComm on the Segway at 9 miles per hour but I hope that Suitable is working on collision avoidance features that will allow them to crank up the speed. You Still Have to Actively Drive It Around - DSM: The issue isn't that it is hard to drive, but the fact that you have to drive it at all. While the mobility is amazing for checking out booths and just simply looking around and engaging with people, there were times I was wishing for an autopilot, or at least an autofollow, as I dutifully followed Howard's Beam around the show. While the Beam team refused to talk about wish lists and roadmaps (whether I was asking about navigation or other features), their eyes positively lit up as they refused to talk. I don't know what exactly to expect, but I am definitely looking forward to seeing it. The Tradeshow Job Seeker of the Future - HSL: While piloting my Beam through the hall I overheard a fascinating conversation from someone else who had rented a Beam.� He was a roboticist that had just graduated college and was looking for work.� He rented the Beam and was going booth-to-booth talking with prospective companies.� He generated a QR code for the link to his on-line resume which he would share out on the screen of the Beam where interested employers could snap a picture with their smart phone. We interviewed Suitable Technologies CEO Scott Hassan on the future of renting Beams at conferences and trade shows.� Scott's goal is to have 10,000 Beams available for rental at the Consumer Electronics Show (CES) in 2015.� The event which attracts north of 150,000 attendees from around the world and covers over 1.87 million square feet of space would be challenging for navigating by bot but Scott's plan is to enable those interested to use multiple Beams simultaneously for each attendee.� As you are meeting with a company at Booth #1, a driver is piloting Beam#2 to Booth#2 while a separate driver pilots Beam#3 to booth #3.� Instead of six 30 minute meetings and two hours of walking, you can do ten 30 minute meetings with no walking, airfare, or hotel.� We are assuming that Beam pilots can be cost-effectively sourced using a labor arbitrage engine like Amazon's Mechanical Turk which has a large virtual workforce on tap for human intelligence projects like... piloting Beams around CES. Can You Cover a Trade Show Effectively as a Journalist Using the Beam? Unbounded Robotics, a spinoff of Willow Garage which spawned the Beam as well, recently debuted its first machine, UBR-1, a $35,000 head and multi-jointed robotic arm on wheels that runs on the open-source Robot Operating System, or ROS.� The company won the "Pitchfire" award at the conference where venture capitalists judged their "pitch" as the best of the robotic bunch.� We spoke with founder and CTO Michael Ferguson who explained the UBR-1 as a, relatively, low-cost platform for research and education, developing robotic apps, and picking, kiting, & packaging applications. The Landrone was cool: It is essentially a robotic base for first responders that can swap out "tops" depending on the mission.� The $30-50K base can carry up to 1000 lbs or pull a full-size truck.� The blue box in Mike's hand is a component pack demonstrating how easy field maintenance is (just replace the blue pack).� The device in Mike's other hand is a "Net Gun" that can be attached and fired which will take down a full size elk.� We tried to get Mike to demonstrate the Net Gun for our cameras but, alas, they had disarmed it for the conference. What was the experience like?� How close was it to the usual and customary experience? What is the future of conferences and trade shows if attendees can simply \"Beam\" in from around the world without physical travel, hotels, and jet lag? HSL: The first thing both David and I were amazed at was how easy that Suitable Technologies had made the sign up process.� Hit a website, reserve your time, make a payment (\$50 Early Bird, \$100 Day-of-the-event for all-you-can-drive, first-come-first-served), watch a 2 minute instructional video, sign some electronic documents saying you won't drive the Beam down any stairs or cause other damage. and then you are thrown into a training class by logging on to a Beam robot at Suitable's corporate HQ where a staffer will help you practice your driving skills and give you some tips for maximizing the experience:� The Beam bot has a party mode where it cranks up the volume of the remote operator to make him easier to hear over the din of the trade show floor and how to share your screen on the bot's display. The undeniable fact is, sometimes you still want to call a location, not a person. If I can't make it to the big board meeting, I don't want to just call an attendee's tablet or phone. I want real \"presence\" in that room. I want to call THE ROOM, not the person. That may mean that I am attending via a Beam or other remote presence device, or that I am presented full sized, across the table, telepresence style. The key is that I am presenting myself as an actual meeting participant, not someone just \"calling in\". In the end, that is the truly compelling element of the Beam experience. It really is \"remote presence\" in the most literal sense of the words. 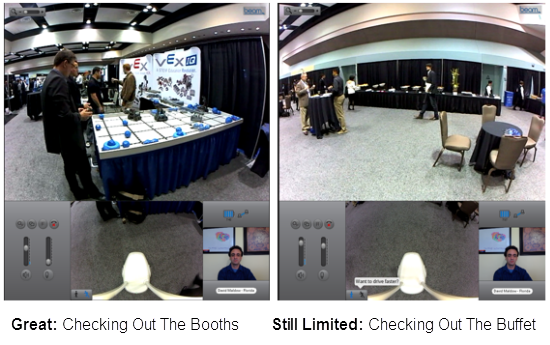 I have called into tradeshows via video before, but this was different. I didn't feel like I was calling in. I felt like I was attending this conference. This effected how I interacted with other attendees, how they interacted with me, and how much I was able to really accomplish and learn at the event. Interestingly, Beam founder, Scott Hassan vehemently denies that his product is a robot. 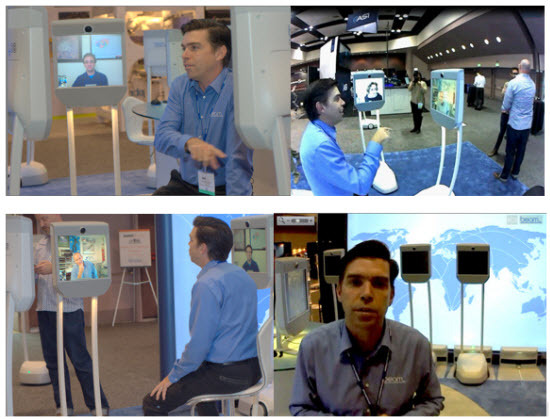 While the rest of the mobile remote presence vendors are happily selling robots, and despite the fact that the Beam looks like something out of a Pixar robot movie, the Beam is absolutely not a robot. I didn't get it either at first, but now it makes perfect sense. Scott explained that the goal isn't for you to drive a Beam around the show all day. The goal is to have hundreds (or thousands) of Beams all over the show, allowing you to simply \"Beam\" from device to device, from booth to booth. Why drive when you can just zap yourself there? This is Scott's dream. He understands that only kids and geeks (like yours truly) want to drive robots all day. Business people simply want to (yes I will say it again) \"Beam\" to a location, meet with people, and get work done. Scott isn't trying to create R2D2 from Star Wars, he is trying to create the teleportation device from Star Trek (the very obvious source of the product's name). \"Beam me up Scotty\" indeed! Unbounded Robotics, a spinoff of Willow Garage which spawned the Beam as well, recently debuted its first machine, UBR-1, a \$35,000 head and multi-jointed robotic arm on wheels that runs on the open-source Robot Operating System, or ROS.� The company won the \"Pitchfire\" award at the conference where venture capitalists judged their \"pitch\" as the best of the robotic bunch.� We spoke with founder and CTO Michael Ferguson who explained the UBR-1 as a, relatively, low-cost platform for research and education, developing robotic apps, and picking, kiting, & packaging applications. The Landrone was cool: It is essentially a robotic base for first responders that can swap out \"tops\" depending on the mission.� The \$30-50K base can carry up to 1000 lbs or pull a full-size truck.� The blue box in Mike's hand is a component pack demonstrating how easy field maintenance is (just replace the blue pack).� The device in Mike's other hand is a \"Net Gun\" that can be attached and fired which will take down a full size elk.� We tried to get Mike to demonstrate the Net Gun for our cameras but, alas, they had disarmed it for the conference.